As the Roman Catholic head Jorge Bergoglio, who is known as “Pope Francis,” traveled to the United States this past week for a six-day visit, megachurch leaders Rick Warren, T.D. Jakes and Joel Osteen expressed their excitement and support for the papal pomp and circumstance. On Wednesday, T.D. Jakes of The Potter’s House posted a photo on social media of himself and his wife at the White House, outlining that he had been invited by Barack Obama to be among the VIP’s welcoming Francis to the nation’s capital. Jakes acknowledged that he has theological differences with the pontiff, but said that he saw the matter as one of loving his neighbor. EEW Magazine notes that Jakes’ comments are not his first expressing ecumenism with the Roman Catholic religion. “When I think of the Roman Catholic Church and their belief in Jesus’ death, burial and resurrection, the fact that they serve the poor, the fact that they’re interested in education, there are many things that we can gather around and agree upon,” Jakes added. 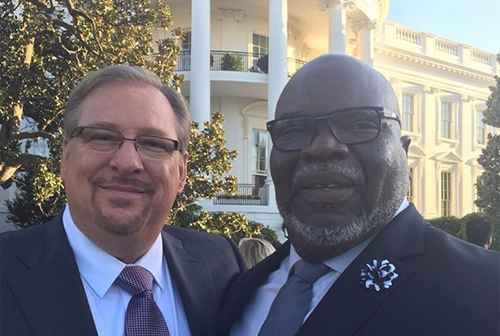 On Wednesday, the Texas-based author and speaker also uploaded a photo of himself with Saddleback Church leader and “Purpose Driven Life” author Rick Warren as they waited together at the White House for the pontiff’s arrival. As previously reported, Warren spoke at the Vatican last November during an interfaith conference on the “Complementarity of Man and Woman.” During his visit, he was recorded by the Catholic News Service as he urged Christians and Catholics to work together. Joel Osteen, leader of Lakewood Church in Houston, Texas, likewise expressed support for the Roman Catholic pontiff this past week in speaking with reporters. But some have expressed concern over the affirmation that evangelicals are giving to the Roman Catholic religion. Jordan Standridge, pastoral associate at Immanuel Bible Church in Springfield, Virginia, released an article this week entitled “Why Evangelicals and Catholics Cannot Be Together.” He pointed to problems stemming from the 1995 “Evangelicals and Catholics Together” document. “Well-known evangelical pastors .. joined themselves with Catholic priests and philosophers in an ecumenical fashion in order to promote the agreements over the disagreements that have plagued Protestants and Catholics for centuries,” Standridge wrote.